These are some of my favorite Matt Kahn quotes from the spiritual teacher and intuitive healer. "Instead of trying to embrace what happened in the past, just love the one who survived it. "Don't fight for love, because love doesn't fight." "Love doesn't give reasons, it only offers opportunities." "When you acknowledge everything you love, you begin to love everything you acknowledge." "You're learning to be nourished by the love you give, not by the validation offered in response to your giving." "Sadness is the love in your heart that has yet to be given away." "When the heart opens completely, you will stumble upon the most powerful force in the universe - your loving eternal presence." "A mind that is free of self-concern becomes a heart that is open to all possibilities." "Underneath it all you won't find anyone deficient in spiritual understanding, but only a heart in need of love." "What you are here to heal is simply an appearance that miraculously dissolves in your supreme willingness to love it as it has never been loved before." "Remember, despite how open, peaceful and loving you attempt to be, people can only meet you as deeply as they've met themselves." "The true benchmark of spiritual maturity is how often your words and actions are aligned with love." Get Matt Kahn's book "Whatever Arises, Love That"
"In understanding, the focus is on you in pursuit of life. In love, the realization is life is in pursuit of you." "Until you realize how the most transcendent states of consciousness are always decorated as everyday life, no amount of practices or purging will do any good." "Change is the only outcome. Choice is the only experience. Seeing is the only option. Life is the only witness." 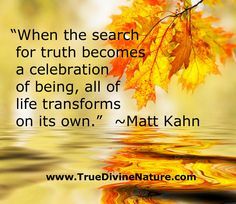 "When the search for truth becomes a celebration of being, all of life transforms on it's own." "Sometimes the only way to discover the treasure you buried is to know when to stop digging." "When you forget your lost, the truth is found." "The most direct route to finding your way is to forget where you are going." "The most direct way to be yourself, is by having no self to be." "The most miraculous outcomes are attracted to those who dare to slow down." "When you move slower than the world, and breathe more deeply than the world, you awaken a consciousness beyond any world." "Whatever you say you see. When you say nothing, you see everything." "You are the freedom of will expressing itself as the will of freedom." "You give to yourself by giving of yourself." "Our greatest offering of surrender is not surrendering our humanity, but surrender through the willingness to be human." "Your will cannot do what the surrendering of your will surely can." "You must act upon the choices of your deepest faith to uncover the results you'll be willing to trust." "Your happiness is a service to others." "You can't miss anything that you're destined to experience." "True peace is having no plans other than facing what is." "True happiness is freedom from opposition." "True healing is the willingness to treat yourself better than the past ever did." "Vulnerability is the doorway of immortality." "Knowing is the memory of concepts, feeling is the celebration of aliveness." "The Universe doesn't mind what you think. It only responds to whatever you say most often." "Judgment is blaming the character for the condition being noticed, compassion is noticing the condition while forgiving the character." 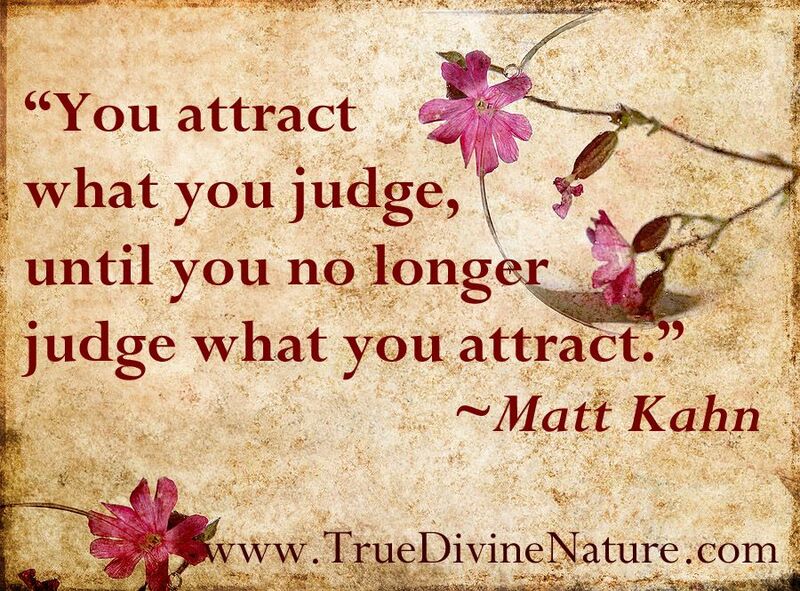 "You attract what you judge until you no longer judge what you attract." "It doesn't matter what anyone talks about, it only matters how deeply you listen." "You don't have to be an enemy of misery to be a servant of joy." "The first step of being the solution is knowing you are not the cause." "I once was a person standing in a space, and now I'm the space where a person stands." "Even as waves constantly collide, the ocean knows no conflict." "The less you define what's yours verses mine, the happier you will be - the more you will shine." "Awakening cannot satisfy you, it can only free you of the need to be satisfied." "A fear of death doesn't mean you are the one who is dying. It indicates that an outdated understanding of life is coming to an end as a more expanded, clearer, and loving view is birthed into form." "Abundance is the energy of permission. The more you permit yourself to desire what you want, express gratitude for what you have, and be excited for whatever comes your way, the more abundance you are bound to receive." "You cannot believe the truth, you can only dare to recognize it." "Most people do no see their beliefs, their beliefs tell them what to see. This is the simple difference between clarity and confusion." "As long as people, places, and things, do not define your blessings, there are nothing but blessings for you to discover."